PARALLEL CARDS: Red Jersey# (#/99 or less), Purple #/50, Gold #/35, Holo Silver #/25, Holo Gold #/10, Emerald #/5, Platinum 1/1, Printing Plates 1/1. PARALLEL CARDS: Red Jersey #/99 or less, Gold #/49 (Herndon #/25*), Holo Silver #/25 or less (No Joshua Jackson*), Holo Gold #/10, Emerald #/5, Platinum 1/1, Printing Plates 1/1. PARALLEL CARDS: Green Jersey #/86 or less, Holo Silver #/25, Midnight #/20, Holo Gold #/10, Black #/5, Brand Logo #/2, Red 1/1, Laundry Tag 1/1, NFL Shield 1/1, Printing Plates 1/1. FOTL PARALLELS: Stars and Stripes #/15, Stars and Stripes Premium #/3. PARALLEL CARDS: Holo Silver #/10, Holo Gold #/5 (No Roquan Smith*) Black #/2, NFL Shield 1/1, Printing Plates 1/1. PARALLEL CARDS: Prime #/25 or less (No Ajayi*), Brand Logo 1/1, Laundry Tag 1/1, NFL Shield 1/1, Printing Plates 1/1. PARALLEL CARDS: Prime #/25 or less, Brand Logo 1/1, Laundry Tag 1/1, NFL Shield 1/1. PARALLEL CARDS: Prime #/25 or #/10 (No Robert Woods*), Printing Plates 1/1. LAUNDRY TAG PARALLELS: Brand Logo 1/1, NFLPA 1/1, NFL Shield 1/1. PARALLEL CARDS: Prime #/25 or less, Printing Plates 1/1. 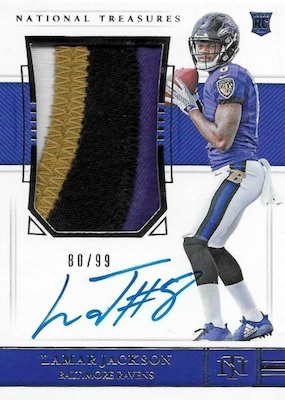 PARALLEL CARDS: Team Logo #/10 (Lamar Jackson #/5*), Brand Logo 1/1, NFL Shield 1/1. CARD VERSIONS: Button Top #/3, New Era #/3 (Samuels #/2*), Laundry Tag #/3, NFL Shield #/3, NFL Shield Tag #/3. * Dante Pettis, James Washington, Mason Rudolph, Jaylen Samuels not in NFL Shield version. PARALLEL CARDS: Laundry Tag #/5, Brand Logo #/2, NFL Shield 1/1. PARALLEL CARDS: Nameplate #/10 or less Laundry Tag #/5, Brand Logo #/2, NFL Shield 1/1. CARD VERSIONS: NFLPA 1/1 (No Ito Smith*), NFL Shield 1/1, Nike Swoosh 1/1. PARALLEL CARDS: Green Numbers #/86 or less (No Hurst*), Holo Silver #/25 or #/10, Holo Gold #/10 or #/5, Black #/5 or #/3, Brand Logo #/2, Blue 1/1, Laundry Tag 1/1, NFL Shield 1/1, Printing Plates 1/1. PARALLEL CARDS: Prime #/25 or #/10. PARALLEL CARDS: Gold #/25 or #/10, Holo Silver #/10 or #/5, Black #/5 or #/3, Platinum 1/1 (No Penny*), Printing Plates 1/1. PARALLEL CARDS: Gold #/49 or less, Holo Silver #/25 or less, Holo Gold #/10 or less, Emerald #/5 or less, Platinum 1/1, Printing Plates 1/1. 62 cards. Serial numbered #/10. PARALLEL CARDS: Prime #/49 or less, Holo Silver #/25 or less, Holo Gold #/10 or less, Emerald #/5 or less, Platinum 1/1, Printing Plates 1/1. PARALLEL CARDS: Prime #/25 (No David Johnson*), Prime Holo Gold #/10 (David Johnson #/5)*, Brand Logo 1/1, Laundry Tag 1/1, NFL Shield 1/1. PARALLEL CARDS: Prime #/25 (Goff #/10*), Team Logo #/4 or less, Brand Logo 1/1, Laundry Tag 1/1 (No Baker*), NFL Shield 1/1. PARALLEL CARDS: Prime #/25 or less, Prime Holo Gold #/10, Laundry Tag 1/1. PARALLEL CARDS: Prime #/25 (Jones/Ryan #/10*), Holo Gold #/10 (Jones/Ryan #/5*), Landry Tag 1/1 (No Lindsay/Davis*). PARALLEL CARDS: Red Jersey# (#86 or less), Gold #/49, Holo Silver #/25, Holo Gold #/10, Emerald #/5, Platinum 1/1, Printing Plates 1/1. PARALLEL CARDS: Prime #/25, Holo Gold #/10. PARALLEL CARDS: Brand Logo #/2 or 1/1, NFL Shield 1/1, Team Logo 1/1. 2 Brand Logo and 6 NFL Shield parallels.